A neutral tritium atom contains one proton, two neutrons, and one electron. Ernest Rutherford, Mark Oliphant, and Paul Harteck were the first to produce tritium. They obtained the isotope in 1934 from a sample of deuterium. However, they were unable to isolate it. Luis Alvarez and Robert Cornog isolated tritium and documented its radioactivity in 1939. The process releases 18.6 keV of energy. The beta particles released by the decay can pass through about 6 millimeters of air, but cannot penetrate human skin. Like protium and deuterium, tritium has the atomic number 1 for hydrogen. Its usual oxidation state is +1. However, its atomic mass is 3.0160492. Tritium bonds with itself or other hydrogen isotopes to form T2 or H2 gas. It combines with oxygen to form a type of heavy water called tritiated water (T2O). Because it is a low energy beta emitter, tritium poses no danger to humans or animals externally. However, it poses a radiation hazard when inhaled, injected, ingested, or absorbed through the skin. The main health risk associated with beta exposure is an increased risk of cancer. Within the body, tritium has a short half-life of 7 to 14 days. Pure tritiated water is unsafe to drink not only because of the radiation hazard, but also because tritium is much larger than protium and tritiated water is denser than ordinary wate. In a nutshell, it disrupts biochemical reactions. The miniscule natural occurrence of tritium in natural water poses no health risk. However, tritium leaked from nuclear sites and improperly disposed lighting can contaminate water. Several countries have legal limits for tritium in drinking water. In the United States, the limit is 740 Bg/l or a dose of 4.0 millirems per year. Tritium has several uses. 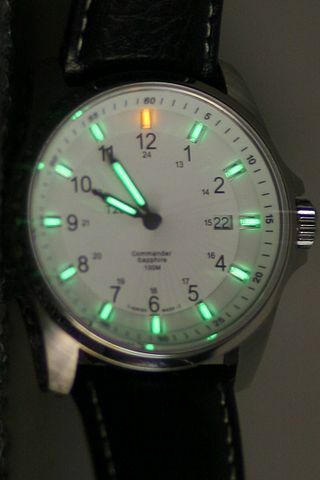 It is used as a radioluminescent light for watches, gun sights, and various instruments. Glowing tritium vials contain the gas and a phosphor coating to produce a colored glow for jewelry and keychains. The isotope is a valuable radioactive tracer. Tritium is used for radiocarbon dating of water and wine. Along with deuterium, tritium is used in nuclear weapons and energy production. Tritium occurs naturally and it is synthesized. On Earth, natural tritium is very rare. It forms when cosmic rays interact with nitrogen in the atmosphere to produce carbon-12 and a tritium atom. There are several methods used to synthesize tritium. In heavy water-moderators reactors, tritium forms when deuterium captures a neutron. It forms in nuclear reactors via neutron activation of lithium-6. Neutron irradiation of boron-10 produces a small amount of tritium. Nuclear fission of uranium-235, uranium-233, and plutonium-239 produce tritium at a rate of about one atom per 10,000 fission events.